Donnell Jones-Craven, chef and general manager of EAT Cafe, says he expects it to open in June. The intimate Lancaster Avenue cafe will operate on a suggested pricing menu and will host artistic endeavors. The area around the 3800 block of Lancaster Avenue in West Philadelphia offers limited choices for dining out. There's a run-down pizza shop, a bulletproof Chinese take-out joint, and not much else. But that's about to change. And Donnell Jones-Craven wants to tell the world. He is standing in front of the freshly painted facade of what will soon be EAT Cafe, Philadelphia's first pay-what-you-can community restaurant, where he will serve as the restaurant's chef and general manager. He stops to chat with almost everyone he meets: someone he knows from the local civic association, a student he recognizes, and neighbors of the soon-to-be restaurant. He wants to tell the curious passersby about the project, a joint effort of Drexel's Center for Hunger-Free Communities, the Vetri Community Partnership, and Drexel's Center for Hospitality and Sports Management. Jones-Craven wants to tell people that soon they will have at least one better option than cheap take-out. A middle-age couple stares at the building as they walk past, sipping large sodas and carrying a brown sack marked with grease stains. "EAT Cafe will serve no sodas," says Jones-Craven. The food will not just be good and affordable - it will be nutritious, as well, minus all those empty calories that come with inexpensive fast food. EAT Cafe will offer vegetable-focused, scratch-made meals available for around the same price as fast food, or even free. "When people dine with us at EAT Cafe, at the end of the meal, they will get a check with a suggested price of about $12 a meal," says Jones-Craven. But the printed check will also make clear that a diner can pay less than that amount, nothing, or more. After all, one of the central goals of the restaurant is to help chip away at the food insecurity that is part of life for nearly one in four Philadelphians. The cafe team hopes many better-off guests will pay a bit extra to help cover those who pay less. But even if the donations don't come pouring in from cafe diners, it won't close the restaurant. To date, the project has been partly funded with a generous grant from the Pierce Family Foundation. "We're writing grants to help ensure continued funding," says Victoria Egan, deputy director of the Center for Hunger-Free Communities of Drexel University's Dornsife School of Public Health. Though this restaurant will be the first of its kind in Philadelphia, the pay-what-you-can model isn't new. There are similar restaurants operating successfully in New Jersey, Colorado, and Tennessee. In fact, around the world, there is a movement afoot forwarding this style of restaurant, a movement whose mission is to mitigate hunger and food insecurity, of course, but also to bring communities together over the ancient ritual of a shared meal. Jones-Craven recently attended the One World Everybody Eats Summit, an annual event that allows those who run pay-what-you-can community cafes to share what they've learned and inspire one another. "Great food promotes community, and fellowship is the thing we all most desire," says Jones-Craven, whose grandfather was a pastor. And when he talks about EAT Cafe and his vision for bringing the community together, he speaks with the passion and conviction of a preacher. Beyond affordable meals, he wants to host community events like multigenerational ladies' teas and oral history sessions during which elders are encouraged to tell stories about their own lives. Though the townhouse that will house EAT Cafe is currently a construction zone, a bare space stripped down to the wooden studs, it appears fully formed in Jones-Craven's mind. He shows off the place, pointing out features as though the work is done. "This will be a performance venue, where local musicians will play," he says, gesturing to a small platform that will double as a stage. "Here's the counter seating, where diners will look into the open kitchen." When construction is completed in a few months (Jones-Craven predicts a June opening), the restaurant will have 40 seats and serve lunch and dinner. Though EAT Cafe's kitchen is far from functional now, he's still working on potential recipes for the menu. Once a month, together with Drexel chef Richard Pepino, he cooks for a community dinner hosted at Drexel's Dornsife Center for Neighborhood Partnerships. It's a free meal shared by the same members of the community he hopes will be regulars at EAT Cafe when it opens this summer. A recent Dornsife dinner featured a choice of fish or chicken seasoned with achiote and served alongside ample braised black beans with kale, peppers, and onions. There was also a fresh and zingy corn, avocado, and jicama salad dressed with cilantro vinaigrette. "A lot of people have told me they [would] come back for the salad, that they've never liked salad before they've had ours," says Jones-Craven. He beams with the pride of getting people to eat their vegetables - and like it. These are the types of dishes that appeal to everyone, not only those who need free meals to make ends meet. And the atmosphere at EAT Cafe will feel just as upscale as the menu. Design services have been donated by Michael Gruber Design. Jones-Craven imagines the restaurant patio will be a real urban oasis. 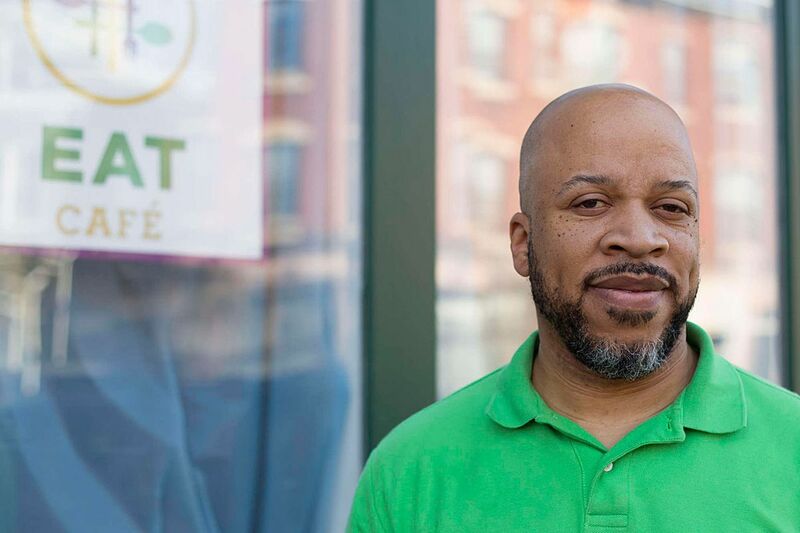 EAT Cafe will be a mission-driven nonprofit wrapped in all the style and culinary savvy of the city's current restaurant boom. Though the space is now a shell, it isn't hard to imagine the dining rooms and patio teeming with people who represent a cross-section of this West Philadelphia community: Older people, students, young families, all from different economic and racial backgrounds but with one thing in common. They all get hungry and want to eat meals in a setting marked more by dignity than charity. The EAT in EAT Cafe stands for "everyone at the table." And when it opens this summer, Jones-Craven hopes to see everyone there.